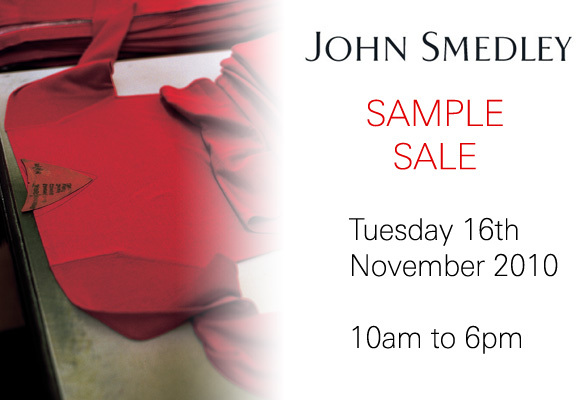 The next John Smedley Sample Sale takes place on Tuesday 16th November 2010 from 10am to 6pm. John Smedley make some of the most beautiful and finest quality knitwear available anywhere in the UK, but their pieces don't come cheap. Their sample sales are open to all and are the perfect way of picking up some lovely items at a fraction of their retail price. You'll find end of range and slight imperfect garments, but arrive early as the best stuff sells quickly - especially in the most common sizes. Payment methods of cash, debit, visa and mastercards are accepted. Where? The Rootstein Hopkins Space, London College of Fashion, 20 John Princes Street, London, W1G 0BJ. Nearest tube: Oxford Circus.